Microtubules provide structural support for cells and play a key role in mitosis and meiosis. They also play a key role in plant cell differentiation, new tissue and organ formation through a coordinated program of symmetric or asymmetric cell division. It is well known that microtubule-damaging agents suppress microtubule dynamics, leading to disruption of the mitotic spindle in dividing cells, cell cycle arrest at M-phase, and the late apoptosis . A better understanding of the processes coupling microtubule damage to the onset of apoptosis will help to find out in process of higher plants development. Recently, the mutant Nicotiana lines with high resistance to antimitotic herbicide isopropyl-N-phenyl carbamate (IPC) were produced [2, 3]. Detailed analysis of IPC-resistant Nicotiana sylvestris plants revealed some abnormalities in microsporogenesis leading to partial pollen sterility. Here we report that these mutant N. sylvestris lines conferring resistance to IPC demonstrate clearly programmed cell death (PCD) events in male gamethophyte formation and development. IPC-resistant and control (sensitive) N. sylvestris plants grown in in vitro conditions and greenhouse were used in this study. Sterile plants of both lines were placed from in vitro conditions to soil for adaptation, and then they were grown in greenhouse. For cytological analysis the roots of control and mutant N. sylvestris lines were treated with 30 mkM IPC for 24 h, fixed in an ethanol/acetic acid mixture (3:1) for 12 h, stained with acetoorcein (1% solution in 45% acetic acid) for 24 h and examined. Bud seeds and anthers were fixed accordingly protocols . After washing the samples were kept in 70% ethanol. The samples were underwent an alkali and enzyme treatment before staining with acetoorcein. The resistance to IPC in mutant N. sylvestris lines were confirmed by us by series of tests and morphocytochemical analyses. For instance, the morphocytochemical analysis of control and mutant lines revealed 6–8 times more resistance to IPC of mutant line as compared with control one. It was found also that the increasing doses of IPC lead to dramatic changes in nucleus and microtubule network in sensitive plants. In control plants tripolar anaphases and telophases were found after treatment with 30 MkM IPC. IPC-treatment resulted also in high number of metaphase+anaphase (from 32.48% in control cells without treatment to 80.07% after treatment) and accumulation of multinuclear cells and lobbed nuclei in treated control cells (see Figure 1d–f). Mitotic figures in resistant (a-c) and sensitive (d-f) N. sylvestris lines after 30 MkM treatment. Bar = 1000 mm. Threshold level of IPC induced an apoptotic process, characterised by cell cycle arrest, hypercondensation of chromatin, an appearance of lobbed nuclei; abnormal, multipolar mitotic spindles, post-mitotic micronuclei formation due to nuclei fragmentation in the root cells of sensitive lines. However, root meristematic cells from resistant plants revealed no disturbances in cell cycle progression after treatment with 30 MkM IPC (see Figure 1a–c). Further investigations shown that control and mutant N. sylvestris plants possessed some morphological differences (see Figure 2). Mutant plants characterised in certain depression resulted in reduction of sizes of vegetative and generative organs, and of plant bodies on the whole. 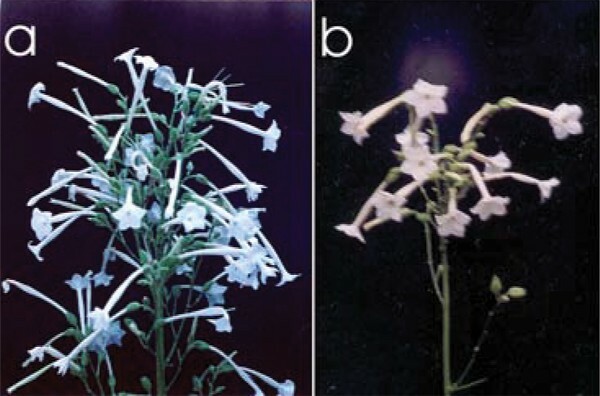 There were slight differences in the appearance of flowers (see Figure 3a) and more visible differences in the length of stamens and pistils between control and mutant lines (see Figures 3b and 3c). The view of flowering parts of N. sylvestris control (a) and 30 MkM IPC-resistant (b) lines. 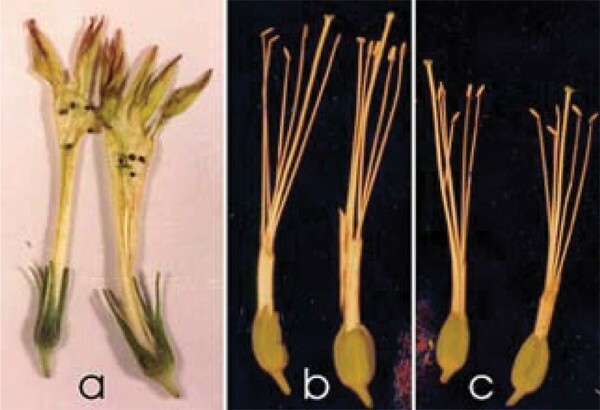 (a) An appearance of flowers of N. sylvestris control (left) and mutant (right) lines; Flower generative organs of N. sylvestris control (b) and mutant (c) lines. More detailed analysis of reproductive organs development of IPC-resistant mutants revealed that microspores in anthers are subjected to degenerative process, leading to pollen sterility. It was found also the chromatin agglutination in nuclei of most part of microsporocytes. During study the microsporogenesis in IPC-mutant plants it was revealed the formation of microspores of different sizes (gigantic, medium and dwarfic: 15.05 ± 0.06 mkm, 7.50 ± 0.23 mkm and 5.15 ± 0.13 mkm in size, respectively) and in different numbers (dyads, triads and polyads). In the same time normal tetrads produced in control N. sylvestris plants (data not shown). 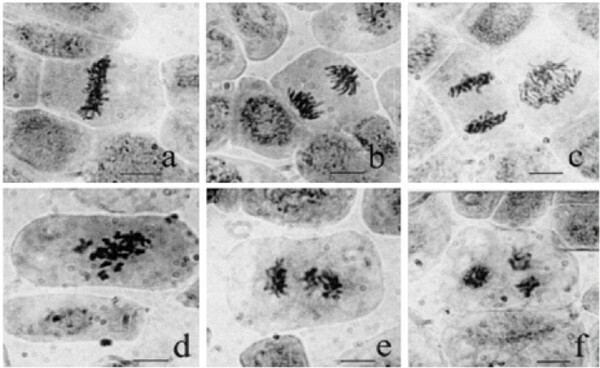 Variation in sizes and numbers indicates on disturbances in chromosome separation in I and II meiotic divisions, loss the second division in one (in the case of triads) and in both dyads, the formation of multipolar spindles (in the case of polyads) in mutants. It was established that pollen grains of control plants possessed the high level of fertility (97.12 ± 0.33%); they were homogenous and synchronous in development. Whereas, genetically non-balanced microscopes of mutant lines after tetrad dissipation were unable to further development. They did not synthesise the fats and new cytoplasm and underwent typical cell death. Only 14.73 ± 1.09% formed microspores got down later to division with vegetative and generative cells formation. As a result, the common number of pollen was reduced in anthers of mutant plants. About 2.88 ± 0.33% of bicellular pollen grains were hydrated and stopped in development. Consequently, the mature pollen of mutant plants was morphologically and functionally non-homogenous. Its fertility in different flowers was from 7.63 to 27.93%. Sterile pollen grains were small, weakly stained or non-stained after incubation with dye (see Figure 5b). They also had reduced contents of cytoplasm as compared with control plants. 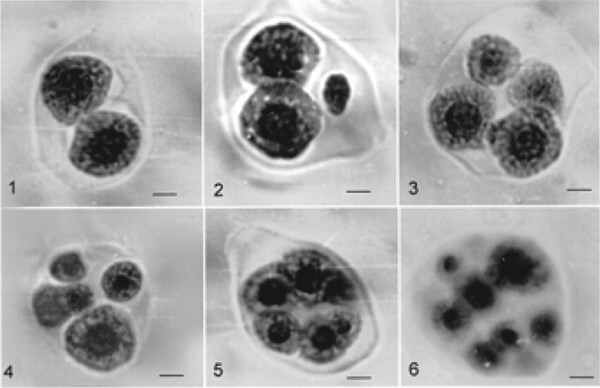 (a) Mature pollen grains from N. sylvestris control (a) and mutant (b) lines. Fertile pollen grains are stained, non-fertile are not stained by acetoorcein. The results of female gametophyte study in mutant and control N. sylvestris plants demonstrated that ovary development after pollination was lower in 1.5–2 times in mutant plants as compare with control ones (see Figure 6). 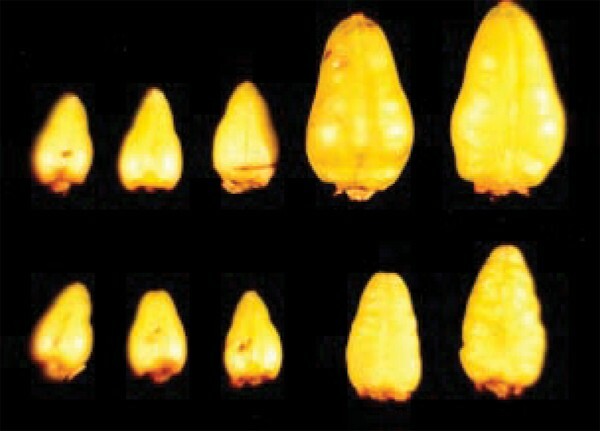 The delay in growth and development was connected with the high number of non-fertilized bud seeds (see Figure 7) in mutant plants. We found strong correlation between fertility level of pollen and a number of fertilized bud seeds in these plants. Ovaries of N. sylvestris control (at the top of the picture) and mutant (below on the picture) lines straight away after pollination, and after one, two, three and four weeks of development. 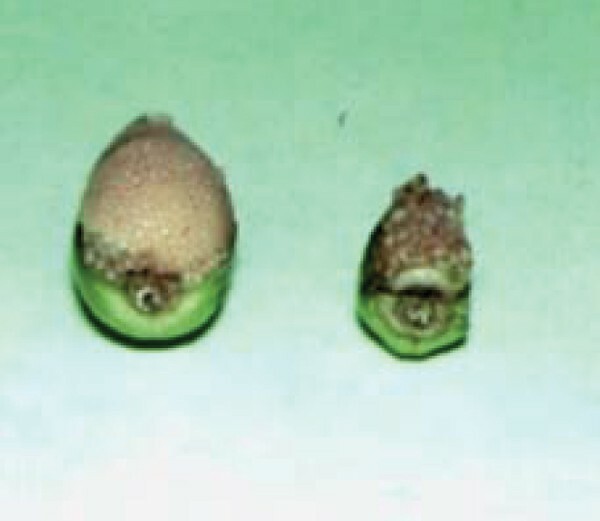 Three-weeks old ovaries in section of N. sylvestris control (left) and mutant (right) plants after pollination. Analysis of fertilized bud seeds of N. sylvestris mutants shown that bud seeds were different in the sizes that indicates on their non-homogeneous and asynchronous development as compare with control plants. It was found that a speed of embryos development in mutant plants was lower than that in control lines, and sometimes an embryo development stopped on early globular stage. Therefore, the seed production in mutant plants was very low due to both high pollen sterility and decreased viability of bud seeds development. Programmed cell death has been observed to occur during many stages of plant reproduction  as PCD is essential for development and survival of plants. But there are still a lot of open questions about genes and their products which might function as signals to evoke a cell suicide program, in particular, during male gametophyte development. Comprehensive reviews about the mutants known to affect meiosis  and about the genes controlled of male gametophyte development  help to understand and clarify certain moments in this issue, but not completely. We suggest also that cytoskeleton proteins, in particular, different isoforms of alpha-, beta- and gamma-tubulins as well as other microtubule organising centre (MTOC) proteins may play a crucial role in many processes of microsporogenesis. Summarising obtained results we can consider that all established abnormalities in male reproductive organ development leading to PCD in pollen production can be arise from a mutation of the microtubule protein(s) in IPC-resistant N. sylvestris lines. We hypothesize also that the mutant protein(s) may represent(s) a key biological trigger in the expression of physiological death at the cellular level in these plants. The analysis of IPC-resistant N. sylvestris plants is continuing to determine the role of certain mutant cytoskeletal gene(s) which is/are express(es) in male gametophyte and lead to PCD during pollen production for better understanding the male reproductive organ development. Disturbances on the stage of late tetrad in N. sylvestris mutant plant anthers: 1 – dyad, 2 – triad, 3 – atypical tetrad, 4 – pentad, 5 – hexad, 6 – polyad. Bar = 0.005 mm.